Europe plays little strategic role in the Asian region apart from its trade relations. Nevertheless in a globalized world everything is interconnected. Should the euro fail, or the EU break apart, the pain would be felt all over the globe, not least in Asia, where economies are seemingly going from strength to strength. Interestingly one feature of European politics is very much the envy of many Asian countries: the continent's institutional and procedural framework that allows the countries of Europe to feed their problems, conflicts, and crises into an existing mechanism with established rules to have them fixed. However inefficient and underdeveloped that structure might often seem to Europeans themselves, the fact that Europe has both the EU and NATO is seen as a huge plus. For Europeans, this view is a big reminder of just how big the achievements of the european integration process really are. To be sure, Europe is flawed in many ways, and the price of being in such a closely-knit union might appear very high at times. But essentially, no one is out there alone. By comparison, in Asia, all existing forums, such as APEC, ASEAN and the like, are more loosely organised with very little binding power. The loneliness of nations in Asia's un-integrated region, and the insecurity and fear it breeds, should serve as a reminder to Europeans in this crisis of just how valuable the system they have created for themselves is. It should also remind people that underneath the economic narrative that so dominates the European debate at the moment lurks a much deeper story: a story of peace and freedom from fear, and how the European Union was the key to creating both. What is needed to make the Euro work? 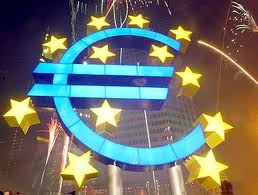 The Euro will not be safe until Europe answers some fundamental questions that it has run away from for many years. At their root is how nations should respond to a world that is rapidlly changing around them. What will it do as globalisation strips Europe and the US of the monopoly over the technologies that have made it rich. Creditor countries want the thrust to be on national responsibility and penalties for rule breakers. Debtors want mutual solidarity; if not direct transfers from rich to poor then at least Eurobonds to pool debt (the European Commission is currently studying options for this). In short, the eurozone is badly in need of its own "Hamiltonian moment" that is the point when Alexander Hamilton committed the US federal government to assume the debts of the individual states. After the adoption of America’s constitution, Hamilton became treasury secretary. The federal government assumed the war debts of the ex-colonies, issued new national bonds backed by direct taxes and minted its own currency. Hamilton’s new financial system helped transform the young republic from a basket-case into an economic powerhouse. America in Hamilton’s time was a young, post-revolutionary republic. Its founding fathers had the prestige to refashion the nation to confront military and economic threats. 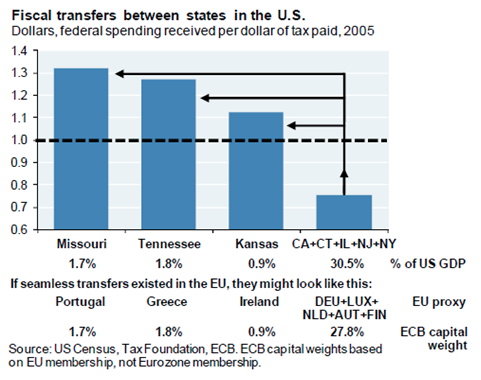 Hamilton’s assumption of state debt was contentious: virtuous states did not think they should pay for lax ones. Allowing speculators to make fortunes from the junk debt they had bought, often from destitute revolutionary warriors, rankled. This all sounds rather familiar. Yet for Hamilton, assuming the debt was a necessary price of liberty. America created political union followed by fiscal union. The reforms of 1789 were followed by a “no-bail-out” policy in 1840 that forced some states into default. The Federal Reserve was set up in 1913 to act as lender of last resort. The 1930s slump led to much-expanded federal spending under Roosevelt. American states are now constrained by balanced-budget rules, but the federal government borrows hugely to bolster demand. But Europe is doing things backwards, creating the euro partly in the hope of fostering political union. So fiscal integration is being pushed not to preserve freedom and a new nation, but to save a failing currency. Restoring Europe to health will take many years. That is because the troubled countries need to control their government deficits and to re-establish sound current accounts by improving their competitiveness. The true test will be in the content of the reforms. Germany will want to replicate its federal system, with more tough fiscal rules and more power for the European Parliament; the French will want a mirror of the Fifth Republic, with joint bonds issued by the euro zone and executive power (and much discretion) left in the hands of leaders. Whereas the European Union exists – somewhat superficially – as a contractual union, in the United Kingdom, three centuries of shared experience and a common set of values has meant that English voters never questioned why English taxpayers’ money was used to prop up Scottish banks in the recent banking crisis. This essentially is the challenge for the EU to create a similar union in a relatively young Union where nation states remain considerable clout - to create a Union of belonging. But that still doesn't resolve the big question what does globalisation mean for Europe? Does it mean Europe becoming more like Germany? (Global banking and trade, high productivity, high taxes, high welfare). Or more like say Texas? (Small budget, low pay, poor welfare). Given the shift in relative wealth and cost advantage away from Europe and the US, trying to make France, Spain, Italy and even the UK more like Germany is improbable. Making them like Texas is doable, but at heavy political cost. Austerity seems likely to be with Europe for years to come, on any policy setting. Globalisation alone will not be suffient to increase growth. Strapped as it is Europe embodies liberal and democratic values – respect for persons, a voice for all, some sense of social equity hence maybe the big questions really are: does embracing globalisation mean dropping these tiresome constraints to unfettered economic growth? And can growth alone be counted on to spread and sustain liberal democracy in 21st century?